A love for detail: Orbis Trachten jacket in mid-brown shades. This design will win you over with its real horn buttons and a soft, sophisticated, shimmering velour leather-look. Subtly padded shoulders and a large box pleat at the back with a buttoned tab accentuate the straight cut of this jacket wonderfully. An ideal fit is basically guaranteed. Three flap pockets and an inner pocket mean that there’s always somewhere to store your valuables and the breast pocket can even be closed with a button. 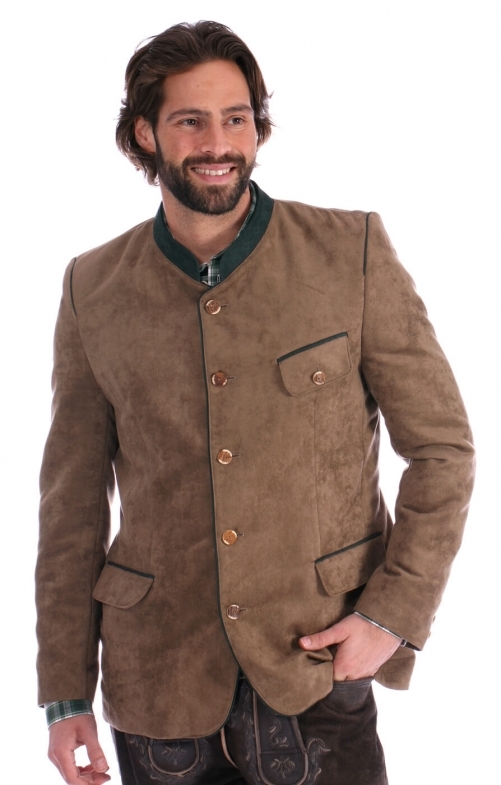 Dark green contrasting inserts on the stand-up collar, pockets and button placket create lovely accents and round this traditional design off with style. The sophisticated black inner lining is decorated with the label’s name and made from polyester. Gute Qualitaet, Preis/Leistungsverhaeltnis ist i.O. Promte Lieferung. Bin sehr zufrieden. Sehr ansprechendes Produkt. Preis-/Leistungsverhältnis sehr gut! Schöner weicher Stoff, sitzt sehr gut.